We Make Cyber Shrines for Cyber Saints! Give us the your proposed saint’s name. This is usually something like "Saint Mildred of Canton". Using a "place" will distinguish one saint from another, but it’s optional. The "place" can be a city, street or neighborhood - or a company or organization such as "Saint Carl of the Mounted Police". Next, we ask you (in about 25 words) to give us the reasons you think this person deserves to be a saint. This citation will appear on the certificate or shrine in the form of "(first name) is…". 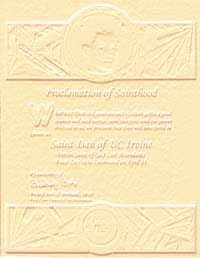 The “Proclamation of Sainthood” is a high-quality reproduction of an original, signed work of art printed on parchment paper. It certifies the new Cyber Saint’s status and can be optionally personalized with the saint's picture! This is a great gift or recognition award for someone special. A congratulatory letter from the First Cyber Church of the Millennium will be mailed with the certificate. If you optionally supply a photo of the saint, we will sepia-tone it and put a halo on the saint. 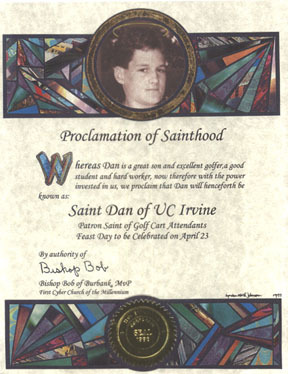 The Cyber Saint’s photo then is printed on the “Proclamation of Sainthood“ certificate or appears on the Cyber Shrine. The Cyber Shrine is a replica of a shrine you would find in an old church or temple, except it exists only in the First Cyber Church of the Millennium’s “virtual cathedral”. A congratulatory e-mail will provide the “keys” (URL address and password) to this private alcove only to the Cyber Saint. 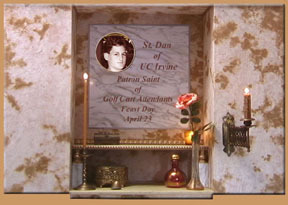 The shrine can be viewed for one year and then can be renewed on the Cyber Saint’s feast day!